I’m a new media thinker, strategist and writer. My current research focus is on the ‘affective bandwidth’ of mobile-mediated communication. My research interests include affective computing, HCI, biomapping, emotion, the impact of mobile phones on social behaviour, analytical design and information visualization. I graduated from the new media track of the Media and Culture masters programme in 2011. It’s a hollow exercise publishing a book about new media art. Giving the work the representation it deserves in one picture and a 500-word description leaves readers sampling only a small hint of the original experience and runs the risk of often-laborious descriptions (“and then it lights up when the user mouses over the block!”). But as a necessary archive of this burgeoning scene comes the eponymous hard-back catalogue of the exhibition El Proceso Como Paradigma (Process as Paradigm), curated by Dr Susanne Jaschko and Lucas Evers at the LABoral Art and Industrial Creation Centre in Gijón (23 April – August 2010). 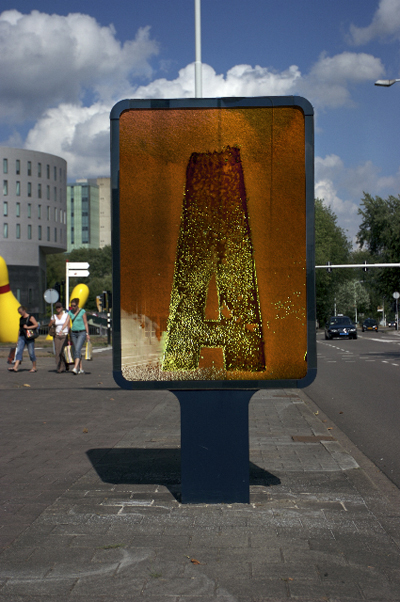 Take Dutch artist Jelte Van Abbema’s work: a street-side poster box traditionally used for outdoor advertising converted into a giant, standing Petri dish filled with micro organisms that transform over time creating an ever-evolving art piece. He maintains the fungi (only for a while) within boundaries spelling out the words TODO and NADA. Or Allison Kudla’s work which uses hand-cultured leaves modified into the shape of intricate motifs applied to tiles. 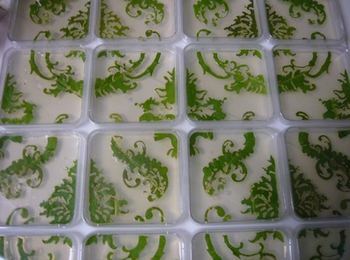 The piece turns into mini ecosystems as the experiment evolves and the leaves sprout new shoots or eventually die off. The work never appears the same way twice. 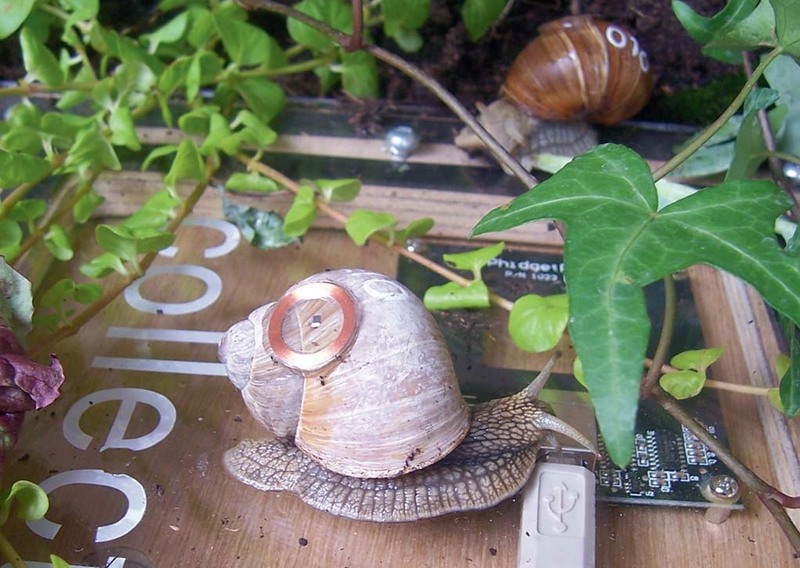 Boredom Research’s comical work titled the Real Snail Mail includes email sent via snails fitted with electronic circuits and antenna and utilizing RFID technology. The recent explorations and themes of English pair Manu Luksch and Mukul Patel indulges surveillance, corporate data harvesting, regulation of public space and technology and its effects on society. Their contribution to El Proceso Como Paradigma is the mixed media piece Love, Piracy, and The Office of Religious Weblog Expansion. They use text from an interview with Iranian philosopher Ali Alizadeh about the history of censorship in Iran that has been blacked out leaving only one word visible in every one of the 1,500 books at the exhibition. Every visitor receiving a book then has to continue the project at its online extension by contributing their word revealing the final text. El Proceso Como Paradigma is far from overworked, keeping the format refreshingly simple. As an exhibition catalogue it does the job of referencing interesting players in this art space and the juicier postscript curator essays at the rear of the book offer a little extra to readers. It’s clear, however that the title is only one part of a much bigger exercise involving the exhibition itself, workshops and many online forums and web extensions. File under “reference”. 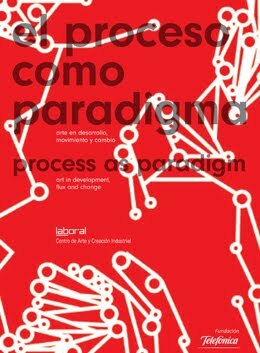 El Proceso Como Paradigma (Process as Paradigm) Art in Development, Flux and Change (30€) is published by the LABoral Art and Industrial Creation Centre. Click here for their online store. « What’s a Good Online Dictionary?